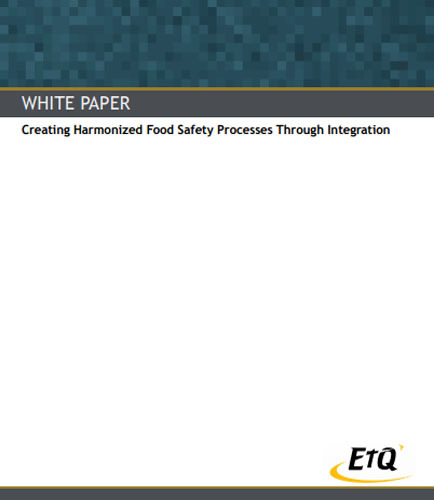 "Challenges of a Food Safety system without integrated processes"
A system that integrates all food safety processes across the enterprise is the key to ensure a high level of compliance down the food chain. The Food and Beverage industry is increasingly adapting the Global Food Safety Initiative (GFSI) as its “stamp” of high quality and safety. Though it might seem cost-effective in the beginning, hiring the wrong contractors could turn out to be extremely expensive in the long run. Without proper screening of contractors, you could be hiring unqualified, uninsured, and unsafe workers. This may lead to an accident occurring at the work-site which could lead to a string of problems and uncertain legal and economic consequences. Download our FREE white paper to learn more about: -Assessing the economic value of a contractor qualification and management solution. -Business conditions that make contractor qualification an imperative for many businesses, including the expected costs associated. -Potential direct and indirect costs of “doing nothing”; that is, deciding against an investment in contractor qualification. -How to outsource contractor qualification to a vendor. This whitepaper is a comparative analysis between cholesterol and inventory and their similar effects on the health of an organization and human immune system. Just like Cholesterol, we have “good” inventory and “bad” inventory. The good one is the one indicated by high number of turns which is indicative of agility and fitness that increase your good cholesterol. The bad inventory can be found as raw material blocking the supply chain in an organization. The right mix of inventory is essential to every business .But there is no easy way to know the right balance of inventory. Download this informative whitepaper to learn about: - Proven methods to know the right balance between ''Good and Bad inventory''. - Preventive measures you can take to get rid of bad inventory. - How to create a global inventory mix that achieves outstanding customer service levels while simultaneously reducing inventory.